"It's not like today was the toughest Pittsburgh Steeler games I've ever played," Flacco said. "I've played really, really tough football games against these guys and probably thrown for 150 (yards) but I take pride in some of those games because I battled really, really hard." PITTSBURGH (AP) — Joe Flacco knows it’s easy to point to his increasingly gaudy stats or the rainbows he’s uncorking with ease as proof that he’s truly back. The Baltimore Ravens quarterback doesn’t quite see it that way. Sure, he feels great. Yet he believes the credit for his team’s hot start should go to the 10 guys on the field with him every play. They’re the ones doing the hard work. Flinging the ball all over the place as he did in a 26-14 victory over the Pittsburgh Steelers on Sunday night is the easy part. The battle was easier this time around for Flacco thanks to a redesigned offense that focuses on creativity and diversity. Flacco completed 28 passes to 11 different players while finishing with 363 yards passing and two scores as the Ravens (3-1) created some early separation between themselves and the Steelers (1-2-1). One that can attack defenses in a variety of ways. Flacco opened the scoring with a beautiful 33-yard strike to John Brown on Baltimore’s first possession and added a 3-yard flip to running back Alex Collins later in the quarter. He wasn’t quite as explosive, but perhaps even more effective in the second half while putting together four extended drives that ate up the clock and kept Pittsburgh’s potent offense off the field. “We want to be creative, we want to keep people off balance but yet be physical with what we are doing,” Harbaugh said. 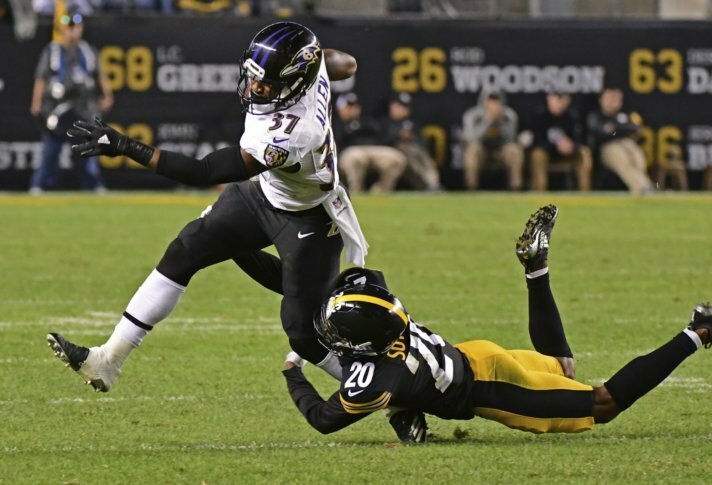 Baltimore was able to do all three while ending a three-game losing streak to the Steelers, who find themselves tied with Cleveland for last in the division a quarter of the way into the season. Pittsburgh’s leaky defense has taken plenty of heat during the team’s sluggish start. Yet the offense looked ordinary for stretches and downright overmatched in the second half. The Steelers managed just 47 yards and three first downs after halftime. He’s hardly the only one. The Steelers did nothing on the ground. Pittsburgh ran for 19 yards on 11 carries. “We were not able to find enough traction tonight,” Tomlin said. The Steelers entered the game as, by far, the most penalized team in the NFL. For the first time all season, the opponents drew more attention from officials. Baltimore was called for seven penalties for 50 yards while Pittsburgh was flagged five times for 40 yards. Steelers: Lost wide receiver and special teams ace Darrius Heyward-Bey to an ankle injury in the first half. Safety Nat Behre exited with a pectoral injury in the second half. Ravens: visit Cleveland to play Baker Mayfield and the Browns (1-2-1). Baltimore has won five straight in the series. Steelers: Welcome Atlanta (1-3) to Heinz Field.